This Italian couple was so full of love and laughter. This portrait captures their connection and the joy they shared together on their wedding day. Making couples feel comfortable enough to be themselves in front of us is such an important aspect to our jobs as photographers. Our couples love these types of that are natural and real rather than stiff or forced. Many of our bride and groom's favorite photos are the ones where they were actually completely unaware of the camera! 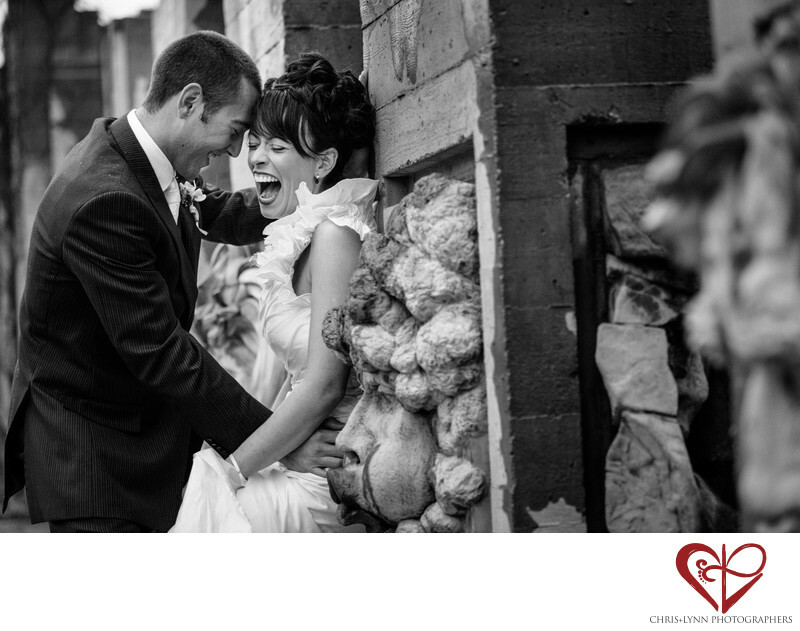 Couples love the natural, unposed photos that are of real moments. This type of wedding photo is often categorized as wedding photojournalism. The term photojournalism originally comes from newspapers and magazines to refer to visual storytelling with candid photos that little to no photographer direction or interaction. Wedding photojournalism is also about telling a story - the story of your wedding day! Instead of doing traditional formal poses or recreating images from other weddings or events, wedding photojournalists capture moments and emotions as they happen. Our previous jobs as photographers for travel and lifestyle magazines helped us hone our photojournalism skills, most importantly the skill of anticipation - anticipating what and when the "decisive moment" will happen & where we should be to capture it. And as this photo shows, decisive moments can be found at anytime throughout the wedding day - during the bridal prep, the ceremony, reception, or in this case a shared moment of laughter during the portrait session. We believe a great wedding photo collection should include formal posed photos, artistic portraits created with the guidance & vision of the photographer, and natural photojournalistic images. Brides often ask us for advice of how to get natural looking wedding photos. Our main tip for them is simply to be in the moment! And savor that moment, no matter what! Allow your wedding planner to concern herself with the ceremony details and reception logistics and focus on what's really important - your family, your friends, and the person you are about to marry. Realize that some things may not go perfectly - a groomsmen might be late, a bridesmaid might break a heel, your flowers may be the wrong shade of yellow- and that's ok! Just laugh it off & enjoy this once-in-a-lifetime day! 1/125; f/2.8; ISO 1000; 85.0 mm.